Jay Cooke was born in Sandusky, Ohio on August 10, 1821. He eventually moved to Philadelpia and started the banking house of Jay Cooke and Company in 1861. Gibralter Island was purchased by Mr. Cooke from J.D. Rivera St.Jago, on January 27, 1864 for $3,001. 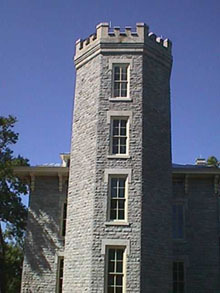 Construction of Cooke Castle started in the spring of 1864. The Cooke family lived in the castle for four generations. The castle is now in the process of being renovated. The restoration began in 1998 with a new roof and windows to help protect the building from the elements. The restoration is continuing with mortar work and when finished, the interior work will begin. Research for this page done by Phil Bilzor.